You are here: Home / Life of a Woman / Stories / My Ex-Husband Thought He Had Killed Me At Last. My Ex-Husband Thought He Had Killed Me At Last. On the anniversary of their divorce, Teri Jendusa-Nicolai’s ex-husband beat her within inches of her life. Trapped inside a garbage can in a freezing cold storage unit, thoughts of her children gave her the will to survive. Sheriff Christopher Schmaling remembers January 31, 2004 as a bitterly cold Saturday night in Racine, Wisconsin. The air was so frigid that even breathing was painful. Schmaling held his breath as he sprinted from his squad car to the station. In the next county over, police officers were following up on a lead in the missing persons case Schmaling was working. They pried the lock off a storage unit, shining their flashlights around the 6-by-8-foot room until they landed on two suspicious objects: a baseball bat with what appeared to be dried blood caked on it, and a garbage can with the lid duct-taped shut—the only container present that was big enough to hide a body. Peeling the tape off and opening the lid, they were horrified to find a woman, crumpled up in the fetal position, her eyes swollen shut, her toes so black with frostbite it looked like she was wearing socks. Even more unbelievable: she was still alive. 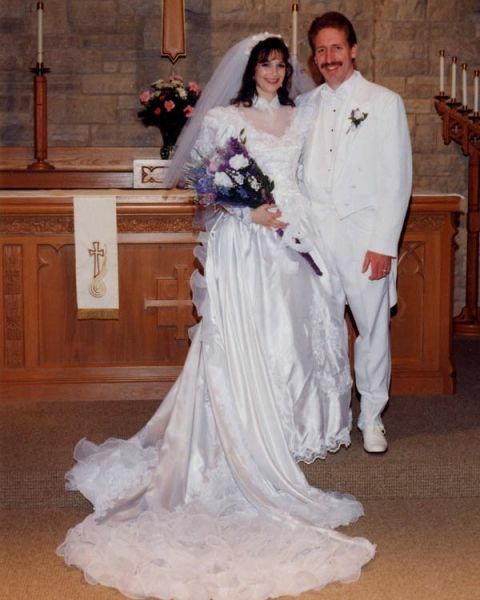 Not long after they married, Teri Jendusa began to see her husband David Larsen’s true nature. He would yell at her if the window curtains were out of place or if the towels weren’t folded a certain way. He insisted she keep the door open when she was showering or using the bathroom. She was so afraid of his explosive reactions to accidents, like breaking a glass, she would throw away any incriminating evidence in the neighbor’s garbage bin. On one occasion, David pulled a freezer-burned sausage link out of the trash and berated her for wasting his money. “Why don’t you bring it over here and I’ll cook it up for you?” she quipped. Teri and David on their wedding day. She’ll never forget the evening David picked a fight over spaghetti. Teri was making dinner and had all of the ingredients out on the counter when her husband demanded she put the package of noodles away before they “went bad.” Teri pushed back: “Do you want to eat dinner or not? They’re dry noodles.” David responded that it didn’t matter if he made sense or not; she was to do as he said. The argument escalated and Teri found herself running down the basement stairs. She had no other place to go; David had installed locks on the inside of the doors that only his keys could open. I’m 30 years old, sitting in a box in my basement, hiding from my husband. What the hell am I doing? she thought. The incident was the catalyst Teri needed to leave David. The couple had two young daughters together, and Teri knew he would eventually abuse them too. She and the children went to live at a shelter. “At the time I was in fear for my life,” she says. On the day they divorced, David sat in the courtroom crying. “You’re going to regret this,” he threatened. Three years later, Teri had turned her life around. She’d met and married a wonderful man, Nick Nicolai, who loved her and her daughters, and they’d recently learned they were expecting. But the divorce from David had spawned a bitter legal battle, with Terri fighting for full custody. “He’s violent towards me—why should he be alone with our kids?” she’d argued, but the court was impressed by the fact that a father wanted to spend time with his children. David continued to verbally and physically assault Teri whenever she would drop off or pick up their daughters. It got so bad that she began insisting they exchange the kids in public places like McDonald’s or the hardware store. She called the police twice and, eventually, filed a restraining order against him. Even though the order barred David from possessing weapons, Teri knew he still kept firearms in the house. But without the search warrant needed to prove the guns were there, police had no way of enforcing the order’s stipulation. 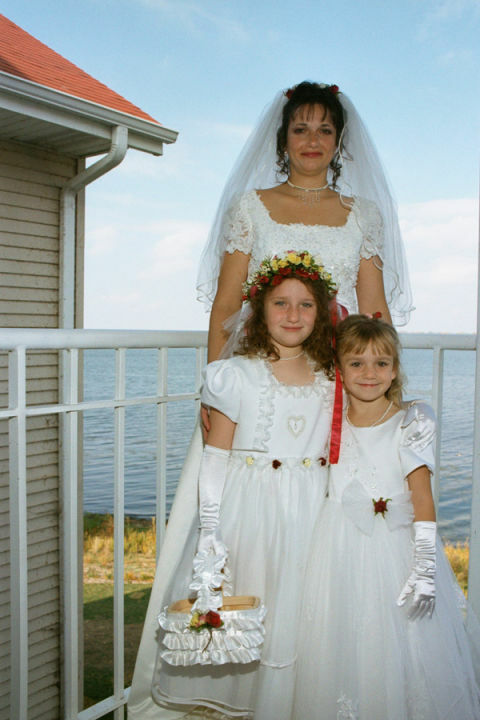 Teri and her daughters on the day she married Nick Nicolai. When Teri arrived that fateful day, David was uncharacteristically calm. The fact that it had been three years to the date since they divorced wasn’t lost on her. He said the girls, then 6 and 4, were playing hide-and-seek and wanted Teri to find them. Even though her gut told her not to, she didn’t want to disappoint her kids; she stepped inside the house. Later that day, three hours after Teri and the girls were supposed to be back, Nick called the police. When he gave dispatchers David Larsen’s address, they recognized it: Earlier, a breathless woman had placed a call to 9-1-1 and given the same address. Deputies were already there, but the house was empty. They questioned neighbors, who said they’d seen David towing Teri’s car earlier that morning. Then a second 9-1-1 call came in. This time, the woman stayed conscious long enough to give authorities critical information. Her name was Teri Jendusa-Nicolai, her ex-husband was trying to kill her, and she was in the back of his green pickup truck. She said nothing about her daughters. Detectives returned to David’s home, hoping they’d find Holly or Amanda there. 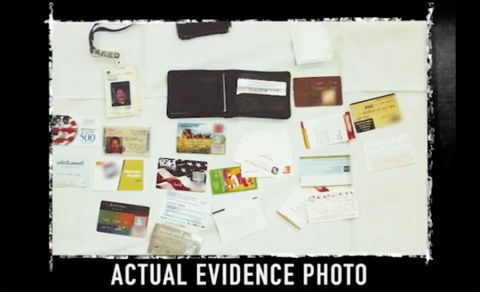 What they found instead made the missing persons case even more urgent: black sweatpants that matched Nick’s description of what Teri had been wearing that day; a large blood stain on the carpet; and an empty handgun case. Now they were operating under the assumption that Teri had been badly assaulted, and David was armed. Nearly a hundred law enforcement officers set out following leads in the case. Volunteers who had never even met Teri spent the afternoon driving around unfinished neighborhoods, searching the basements of incomplete houses for any sign of her. “The community was held at bay for 26 hours,” recalls Schmaling. When an Amber Alert returned nothing, police waited for David to report to his job as an air traffic controller. But there were no signs of Teri or their daughters in his car when he showed up. Officers told him his ex-wife was missing; would he mind coming down to the station to see if he could help? Detectives Chris Shmaling and Thomas Knaus would spend six-and-half hours questioning David when it was all said and done. Right away, he told them Teri hadn’t shown up to pick up their daughters, so he had dropped the kids off at his girlfriend’s house before heading to work. Authorities checked the location and were relieved to find the children there, but both girls said they hadn’t seen their mom that day. “I was begging him, talking to him with a tremendous amount of respect,” says Shmaling. Time was of the essence if they were going to find Teri alive. Then, detectives dropped the bomb that they’d found Teri’s pants—and blood—in David’s house. “He started getting emotional as I was calling him on his lies,” says Shmaling. David claimed Teri had attacked him and that he’d responded in self-defense. The rest, he said, was all a “blur,” but authorities finally had enough evidence to detain him. In doing so, detectives confiscated what personal belongings David had on him, including a wallet jam-packed with business cards and receipts. Inside, they found a card for a storage facility near the town where David owned property—a phone call confirmed that he had a storage unit there which he’d visited that morning. Police officers found Teri in the corner of that unit; her core body temperature was 86°F. She was within an hour of dying, doctors would later say. The fetus that had been growing in her belly for weeks was no longer viable. David Larsen had inflicted so much trauma on Teri, including a crushing injury to her skull, authorities feared they would cause further damage if they tried to move her from the trash can—so they left her in the garbage receptacle until paramedics arrived. David had been so confident in his ability to get away with murder that he hadn’t checked Teri for a cell phone before forcing her into the garbage can he loaded onto the back of his truck. He had brutally assaulted her with a baseball bat while their daughters sat locked in the back bedroom of his house, crying because they were hungry and no longer distracted by the movie playing in the background. After Teri was left to die in the storage unit, her thoughts turned to her family. “If you have kids, or someone you want to stay alive for, that’s enough,” she says of her incredible will to live. She checked to see if David was around by calling his name. When he didn’t answer, she started screaming for help. Teri, center, speaks onstage at a 2013 panel on domestic violence. On Aug. 16, 2005, David Larsen was sentenced to 35 years in prison for attempted first-degree intentional homicide. Terri spent almost seven weeks in the hospital undergoing 10 different operations, and even after she returned home, remained wheelchair-bound for several more weeks. She was “pissed” that she could no longer jog and, at least for a while, couldn’t get upstairs to tuck her daughters into bed at night, but she was grateful that she and her girls were alive and would never have to see David again. Looking back now, she laughs: the person who tried to take her life ended up losing nearly every semblance of his own. In the 13 years since the harrowing event, Teri has been instrumental in helping to draft laws that protect domestic violence victims, likeWisconsin’s SAFE Act, which takes guns out of the hands of abusers. (David threated Teri with the same gun he was supposed to have turned over as part of her restraining order against him.) The 2014 law gives more authority to sheriff’s deputies, who previously couldn’t take an abuser’s firearms without a warrant. In March, Teri’s story aired as the premiere episode of Oxygen’s new female-focused, true-crime series Three Days to Live. The show’s title comes from the statistic that for every hour after a woman is abducted, the chances of finding her alive diminish greatly within the first 72 hours. The finale airs this Sunday at 9pm ET/PT.